Other Ingredients: maltodextrin, vegetable cellulose capsules, vegetable magnesium stearate, silicon dioxide. No: sugar, salt, yeast, wheat, gluten, soy, dairy products, artificial flavoring, artificial preservatives, or artificial coloring. Recommended Use: 1 capsule daily, may increase to 1 capsule twice daily for additional support. Propolis is a Greek word meaning "Defender of the City". Bees use propolis to protect the health of the hive. 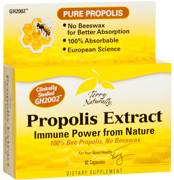 Now you can benefit from propolis' powerful immune defense. Get the maximum benefits of this gift from nature. GH2002™ is a clinically studied propolis of Germany.